KANSAS CITY, Mo. 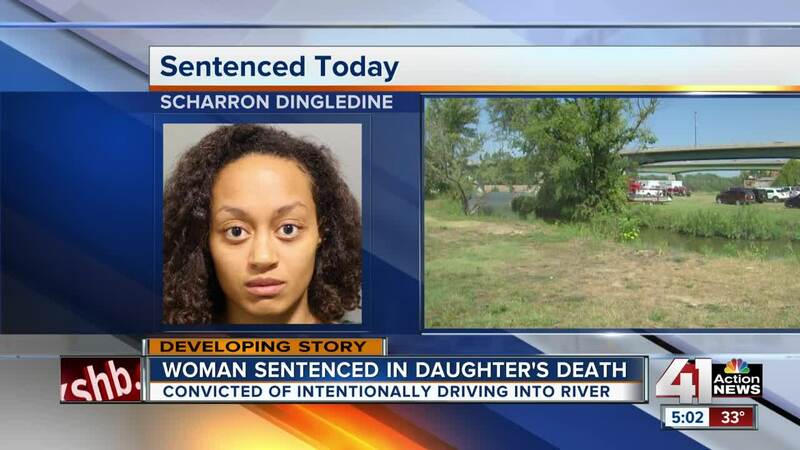 — A woman who intentionally drove her car into the Kansas River, killing her 5-year-old daughter, was sentenced Tuesday to life in prison. Scharron Dingledine, 26, of Columbia, Missouri, will be eligible for parole after 25 years. On Aug. 3, Dingledine drove her car into the Kansas River in an attempted-murder suicide, officials said. Officers rescued Dingledine and her 1-year-old son, who was hospitalized with critical injuries. Her 5-year-old daughter, Amiyah Bradley, was found dead the next day. Dingledine pleaded guilty to first-degree murder and attempted first-degree murder in December. At the sentencing hearing, an attorney for Dingledine said that the 26-year-old mother was diagnosed with bipolar disorder and became depressed six months after her son was born. On the day she drove into the river, Dingledine got into a physical altercation with her boyfriend, the father of her 1-year-old son, Dingledine's attorney said. She was found placement in a shelter, but only her daughter was allowed to come with her. Because of her mental illness, Dingledine saw no other way out and took her children to Lawrence in a manic state, her attorney said. Dingledine drove her children around Lawrence, and they ended up playing near the Kansas River, her attorney said. Dingledine told officers that she became fixated on driving into the river and drove by a police station to get help, but she didn't stop because she said she was in trouble. Douglas Country District Attorney Charles Branson read a letter from Amiyah’s father in court, which said that "my daughter will never be able to smile again."